I was quite amazed at the amount, variety and quality of ancient monuments to be found, and visited, all over Ireland. In order of age the earliest site that I visited, and featuring also at the beginning of the first chapter ‘Ireland Before History: The Stone Age’ is Knowth which, along with its, probably better known, neighbour, Newgrange, is “one of three great burial mounds erected in the ‘sacred landscape’ of the Lower Boyne Valley in Co. Meath.” The two passage-tombs under the great tumulus were probably erected before 2500BC. Around the main mound are several recently reconstructed ‘satellite’ tombs. I didn’t have time to visit both mounds as I was travelling between Co. Kildare and Co. Fermanagh but I did manage Knowth and will definitely return to see Newgrange, especially now that I know how the system for visiting works! My Heritage Ireland Card gave me free admittance to the site. I had arrived across country and found the approach lanes surprisingly quiet but on arrival in the crowded car park and on joining the queues at the Visitor Centre I discovered that most people and all coaches arrive via the nearby Motorway. There’s plenty to see in the Centre and then time to catch the timed minibus to Knowth where you get a very full guided tour inside and outside the tumulus. It’s quite amazing that the carved stones around the base of the mound have been preserved across the centuries. Just one example of the stone carvings! I will definitely visit again and get to Newgrange and maybe also the site of the Hill Tara which seems to be very little visited. WARNING These connections are very tenuous but I found them interesting and hope you do too! Charles Stewart Parnell was dubbed “The Uncrowned King of Ireland” despite being a Protestant landowner in Ireland. He was also famous for his ‘scandalous’ affair with the married Kitty O’Shea. Read a resumé of his life and influence in Victorian Ireland here. My maiden name was Parnell and when my sister-in-law and husband suggested a visit to Avondale House in Co. Wicklow, Parnell’s former home, I was delighted. As far as I am aware there is no family connection. Surprisingly, Avondale House was open on weekdays in May. I’ve just looked at the website and see that it is now closed until further notice due to work being carried out. There were no other visitors but I was able to tour the house, buy postcards and we enjoyed tea and cake outside at the picnic tables. The house and grounds are now owned and managed by Coilte Outdoors (Irish Forestry). We did come across a group of walkers who were enjoying the extensive estate and woodland/forest paths. If ever I’m lucky enough to return to Avondale I’d love to take a hike there. The house tour begins with a specially commissioned audio visual presentation. Most of the main rooms of the house can be visited and photography is allowed. After visiting the ground floor apartments, which are suitably decorated and furnished for the period, the tour continues upstairs where there is some exhibition space and artefacts formerly belonging to Parnell and family. The American Room was the bedroom in later life of Parnell’s American mother, Delia Tudor Stewart the daughter of Admiral Charles Stewart who manned the USS Constitution during the 1812 War. Both he and his ship gained the nickname “Old Ironsides”. Delia died as a result of burns which she received after a fire in this room. The Wooton Desk was originally the property of her father. There is a well-known (in Ireland, anyway) song about Parnell – The Blackbird of Sweet Avondale. My other family connection is more real but it has been hard to find much concrete evidence. During the War my Dad served in the RAF and for a while, early on in his career, for he spent most of the War in India, was stationed (presumably for training) in Northern Ireland. One of the places he used to talk about was Newtownbutler. Before I went to Ireland and whilst I was staying at the Crom Estate in Co. Fermanagh I tried to find out more about radar stations in the area but with no luck at all. I spoke with two chaps who were interested in finding out about what went on in the area but we were none of us able to shed any light on the situation. This was all we could find (and the date is too late for Dad as he was already on his way to India). 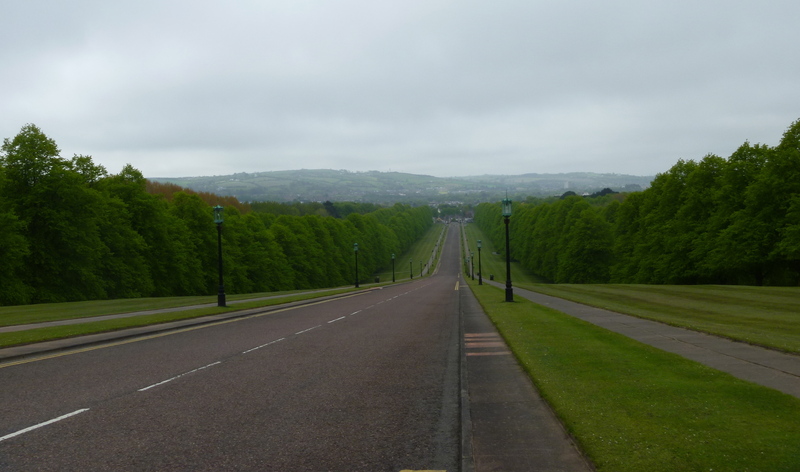 Scroll down to two photos labelled Newtownbutler. I’ll just to divert for a moment here to mention that The Crom Estate played an important role during the Second World War and there was a good exhibition in the National Trust Visitor Centre on the site. In the autumn of 1942 American soldiers arrived and used the estate to prepare for D-Day. The officers lived in the Castle and the men in Nissen huts scattered throughout the site. They practised building bayley bridges, marching and manoeuvres. I visited Newtownbutler itself, tried to find the site of the former radar station which is now private land and not easily accessible and enquired at the Co. Fermanagh Information Bureau in nearby Lisnaskea but all to no avail. The village was really just a couple of streets leading to a crossroads. Still, I’m happy to have visited somewhere that Dad spent time and he talked about Northern Ireland with great affection. British forces, of course, were not allowed to cross the border into southern Ireland as it was a neutral country at the time. Gate lodge, or gatelodge, seems me to be an Irish term for what we, over here, would just call a Lodge. In amongst the majority of what I could only call dross (although there was one excellent shelf of local (in the sense of Northern Irish) books [see photos below]) in the Library at The Barbican, an Irish Landmark Trust property on the coast of Antrim in Northern Ireland, I found a most interesting book. “The Gate Lodges of Ulster : a gazetteer” by J A K Dean; Ulster Architectural Heritage Society, 1994. The book came about as a result of research carried out by Dean 30 years earlier. Another look at the topic during the early 1990s revealed much demolition and decay had occurred and a comprehensive renewal of study lead to the publication of the gazetteer. I’m wondering whether a similar study has been carried out in the South – a much greater project. Gate lodges had much to teach about developing awareness and ambitions of their patrons, and the changing skills of builders and architects. There’s a huge variety- from vernacular tradition to architectural sophistication yet they had a single simple purpose – to house the gatekeeper and his family. The Gazetteer is a fascinating study of individual gate lodges. Here I’ve abstracted details from the book and added my photos. Built c1880 i.e. after the Weir’s Bridge was built to carry the Enniskillen-Florence Court-Belcoo line of the Sligo, Leitrim and Northern Counties Railway. It’s a fine building in the Lombardie style [sic]. Built from the highest quality ashlar sandstone with immaculately carved detailing. Single-storey on a T-plan. It has a raised stepped platform to form a “porte-cochere” with semi-circular headed arches. These were even recorded as being dilapidated in 1834. They not even mentioned on OS maps until 1857. Now they’re presented as Georgian Gothick. Built so close together a family carriage could hardly pass through. The chimney stacks have now been lost. Armar Lowry-Corry (1st earl of Belmore) the builder died in 1802 and his son Somerset had an energetic building programme for 40 years. He built up a lasting relationship with architect Sir Richard Morrison. The main entrance lodge at Crom was built in 1838 by Edward Blore, architect. Blore was responsible for many other buildings on the Crom Estate. It’s an irregular Tudor picturesque cottage on one and a half storeys. Dean’s book also contains interior plans. It has two main gables and pretty serrated bargeboards plus finialed hipknobs. On Wikipedia I found that a Hip-knob, in architecture, is the finial on the hip of a roof, between the barge-boards of a gable. The small gabled hall/porch has the only remaining lattice panes. The Gate Lodge at the National Trust property Springhill in County Londonderry is now the secondhand bookshop. It stands at the original main entrance (which is now now the exit) and was built not long after George Lenox-Conyngham succeeded to the property in 1788. It is the sole survivor of a pair of Georgian Gothick porters’ lodges. Their gables faced each other across the avenue entrance. It is a simple rectangular two roomed structure, has steeply pitched gables with a wide door opening and a minuscule lancet opening above to light a bed loft. Built in 1824, the Barbican’s architect was William Vitruvius Morrison. 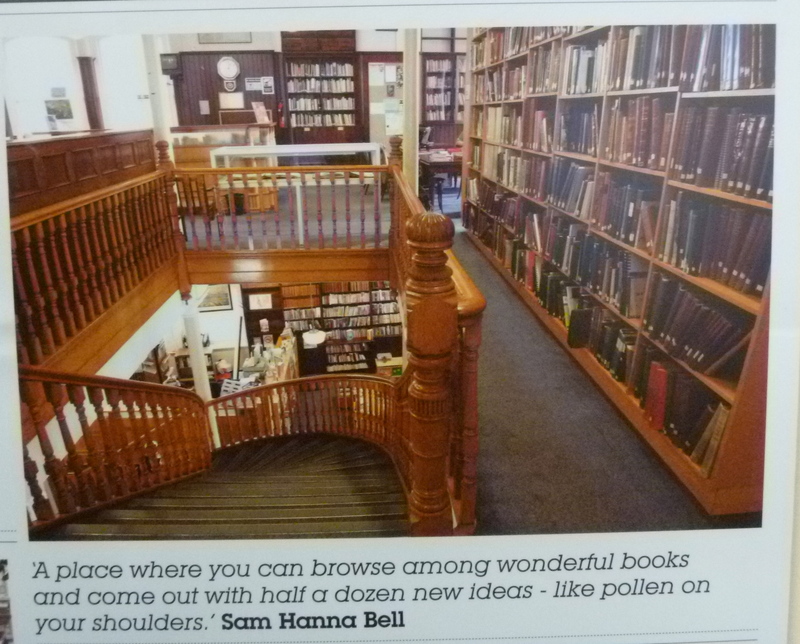 Dean writes : “Beloved of photographers and Victorian illustrators for its dramatic architecture and romantic setting. Approached across a two-arched bridge spanning the Glenarm River the Barbican is a three-storey castellated gatehouse. An ancient sandstone coat of arms was inserted.” This had originally graced the front of the castle when it had been built by the first earl in 1636, while the other side of The Barbican was also given a commemorative plaque: THIS GATEWAY WAS BUILT AND THE CASTLE RESTORED BY EDMUND M’DONNELL, ESQUIRE, AND HIS WIFE ANNE KATHERINE, IN HER OWN RIGHT COUNTESS OF ANTRIM AND VISCOUNTESS DUNLUCE A.D. 1825. Attached to one side is the two-storey porter’s accommodation – one up and one down. Well, we only touched the tip of the iceberg on our visit to Belfast. 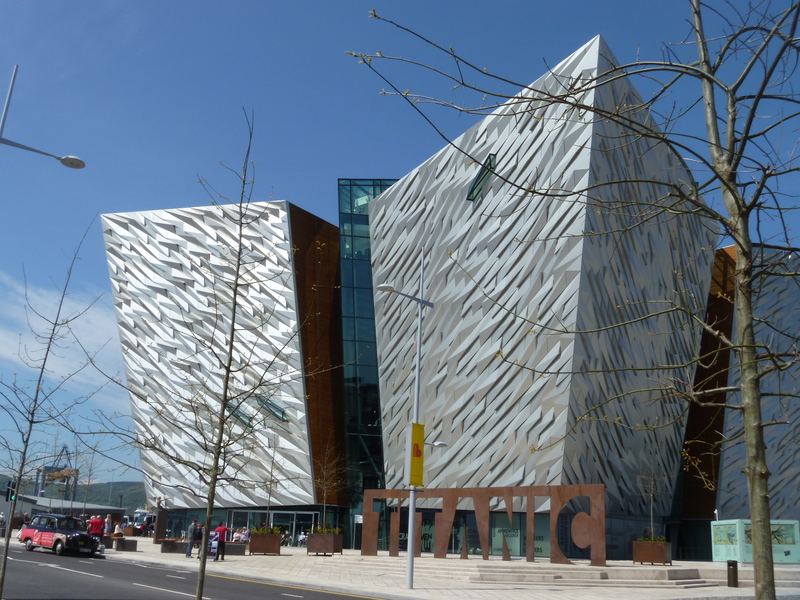 Our day was divided into three – time to look around the centre unaccompanied, a bus tour with a Blue Guide and the Titanic Experience – Belfast’s all new, all singing, all dancing visitor attraction! Our coach dropped us off bright and early in the centre of Belfast on Great Victoria Street. We crossed the road and went to peer in the windows of the beautifully preserved Crown Liquor Saloon. 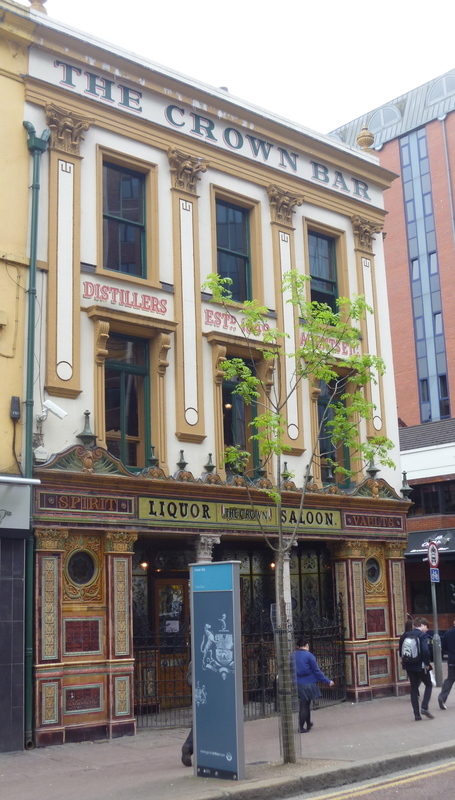 This pub, right opposite the most bombed hotel in the world – The Europa Hotel – is now owned by the National Trust. In fact it was the first pub that the NT ever took over in 1978. 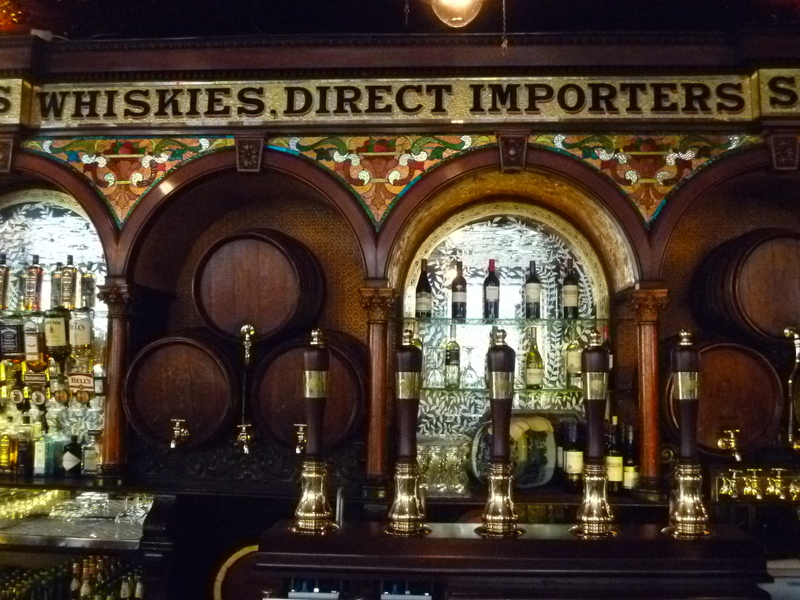 Of course, the pub wasn’t due to open until 11.30 by which time we would be well into our city tour but we were lucky enough to catch an employee who very kindly showed us into the side door for a quick look round and gave us each a leaflet on the history of the bar. 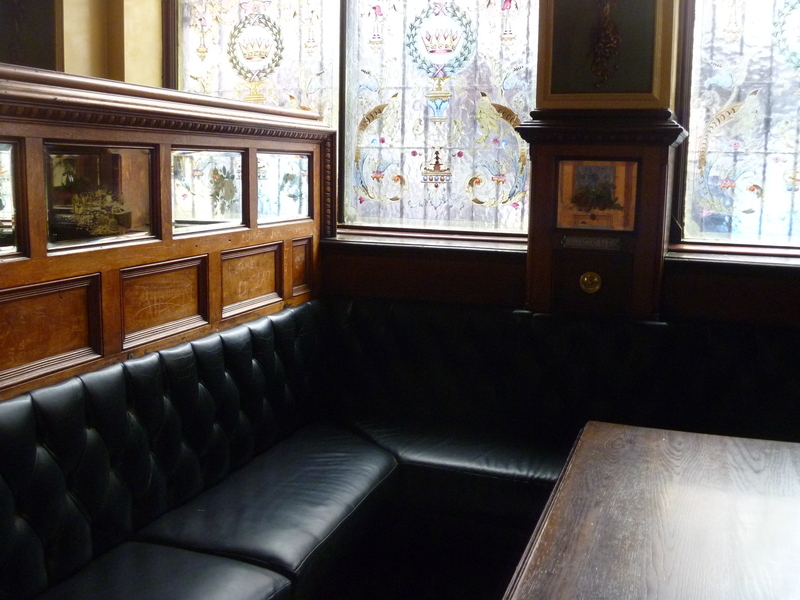 Dating back to 1826 it was originally called The Railway Tavern but in 1885 the son of the then owner, being a student of architecture, decided to brighten up the old family bar. It was mainly due to skilled Italian craftsmen employed elsewhere in the city who supplemented their incomes by moonlighting at The Crown and who made it the prize gem of Victoriana that it still is today. We decided to stay around the centre of Belfast in the area around Donegall Square in the middle of which is the City Hall. 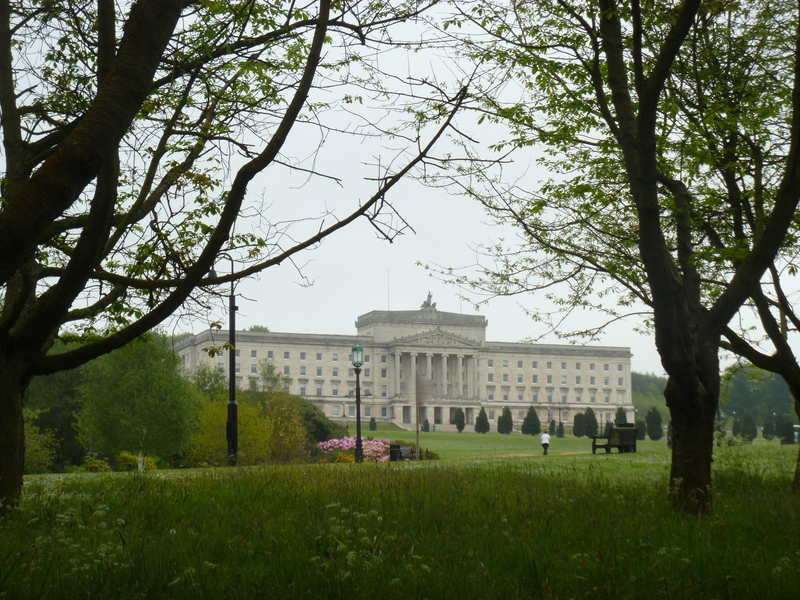 We discovered on the guided tour that it is possible to book a tour of the building, that it houses a decent cafe called Bobbin and that there is a Titanic Memorial Garden in its grounds. Then we came across a real treasure. 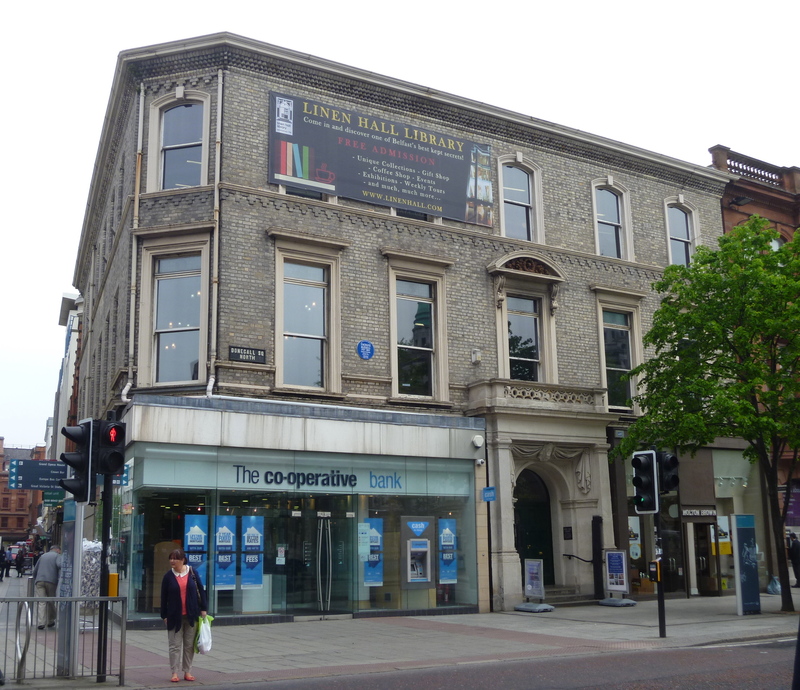 17 Donegall Square North is the address of the soon to be 225 years old Linen Hall Library. 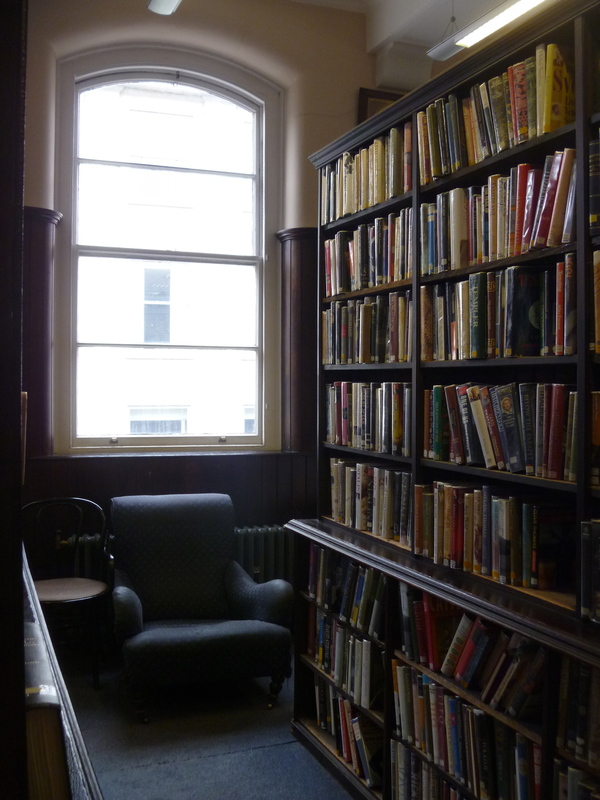 Founded in 1788 it’s a subscription library like The Leeds Library but it’s doors are open to the public. 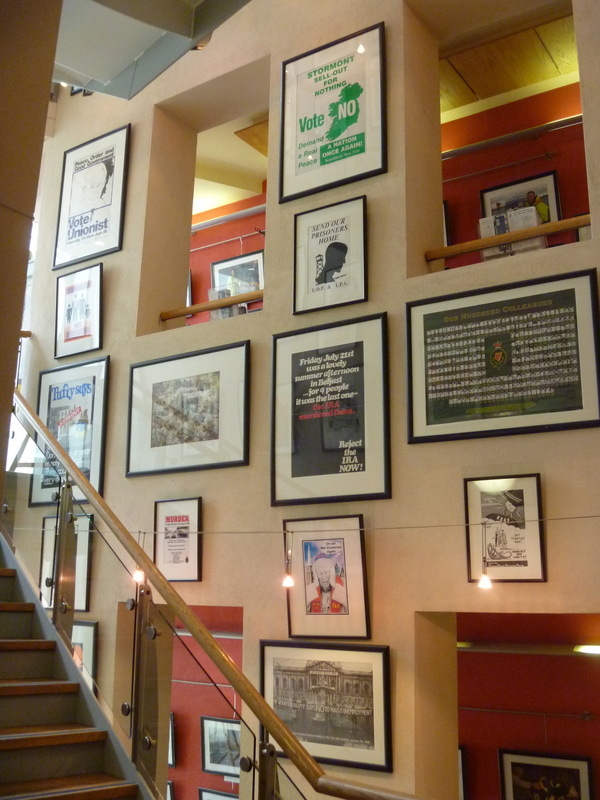 “All 70 political posters from our ‘Troubled Images’ exhibition, documenting the years of the Northern Ireland conflict, have been hung five storeys high in our Vertical Gallery. 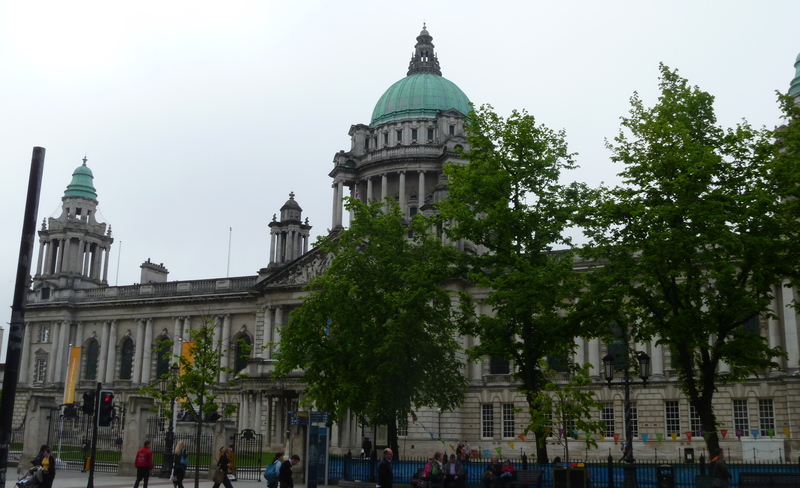 We re-joined our coach at 11 and enjoyed a 90 minute guided tour of Belfast learning many facts about the city and seeing The Queen’s University, the Grand Opera House, the (leaning!) Albert Memorial Clock, the River Lagan which forms the boundary between County Down and County Antrim, St Anne’s Cathedral, the Botanic Gardens, the Falls Road and, most significantly, Stormont, the seat of the Northern Ireland Assembly, and its surrounding parkland. 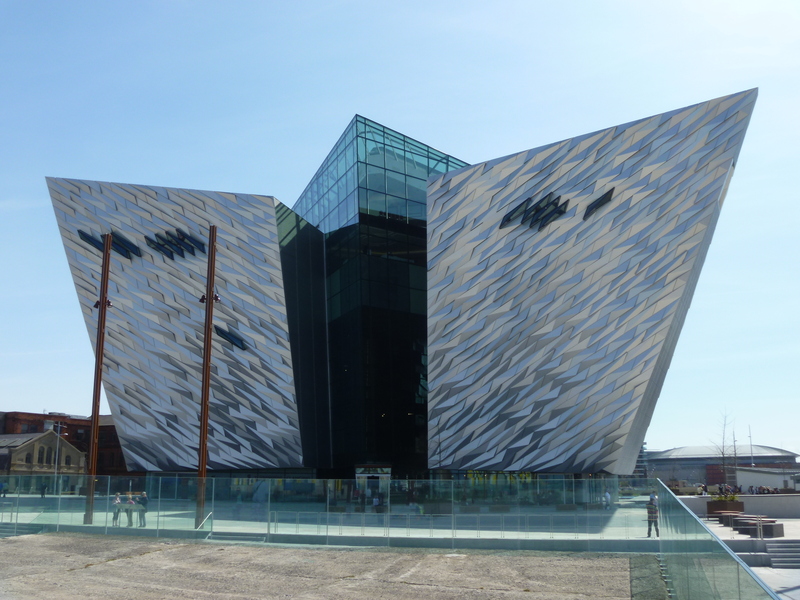 Our destination for the afternoon was the brand new, recently opened Titanic Experience. This fine visitor attraction was extremely well done with lots of variety and as much or as little information as you require but quite frankly I felt that I was suffering from Titanic overload after all the hoo-ha and media coverage that it has received over the last few months. It will be give a huge boost to the city which can only be good news and I wish Belfast well and all who sail her!